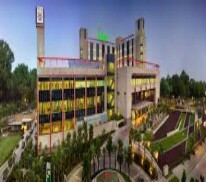 Fortis Memorial Research Institute, Gurgaon, is a multi-super specialty, quaternary care hospital with an enviable international faculty, reputed clinicians, including super-sub-specialists and speciality nurses, all committed to integrating their exceptional medical expertise, technology & innovation to offer best – in class treatments..
A premium, referral hospital, it endeavours to be the 'Mecca of Healthcare' for Asia Pacific and beyond. Set on a spacious 11-acre campus with 1000 beds, this 'Next Generation Hospital' is built on the foundation of 'Trust' and rests on the four strong pillars Talent, Technology, Infrastructure and Service. Fortis Memorial Research Institute has a complete spectrum of diagnostic and therapeutic technology, including several state-of the-art technologies that are first in the world, first in Asia and first in India. With landscaped greens, tranquil water bodies, sculptures, sunlit interiors, Fortis Memorial Research Institute follows a design philosophy aimed at healing. The hospital has been built keeping in mind all round wellness – mind, body and soul. Simultaneously meet simple needs of the caring attendants by means of facilities as the Tummy Tuck, Meditorium, R&R lounge, Holistic Health, Mamma Mia, Retail Therapy, Crèche, Health 4 U, Spa & Fortiplex, to meet the simple needs of caring attendants. Woven into the fabric of the hospital are innovative services, where every attempt has been made to look after our patrons so that they feel cared-for and special. Angel: A welcoming face at the hospitality desk to make visitors feel special. Genie: A friendly and helpful companion to assist patients navigates the hospital. Concierge: A facilitation desk to assist patrons with various needs in and outside the hospital.